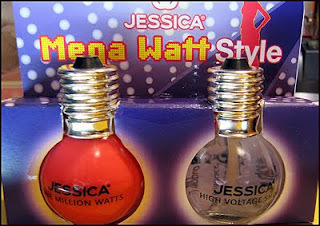 Jessica nail polishes - Cherry Colors - Cosmetics Heaven! I'm really excited to try them out. They are part of the Summer collection but I don't mind, because I wear nail polishes that suit my current mood. 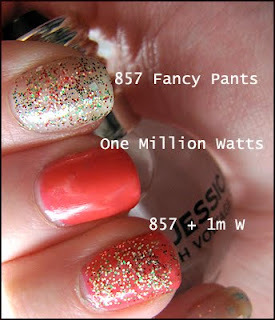 Here they are; High Voltage (Brilliance top coat), One Million Watts (hot pink) and Fancy Pants (glitter nail polish). The come in the prettiest bottles ever, like light bubbles - very cute! I am afraid to try this one, because of the nightmare of cleaning glitter nail polishes, but then again... glitter calls me, wants me to try it and wear it! EDIT: I had to try them! I put them over my glittery nail polish, because I was too excited to take it off... Anyway it is a transparent nail polish with big silver glitter chunks. You can see the glitter stuff on the index finger, the big silver square. So that is the other polish.. The pink polish is quite sheer, so I think that three layers would give the perfect coverage. The finish is gorgeous, pure shine! 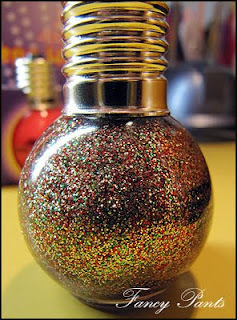 And the glitter.. ahh I love it! I thought I'd hate it, but it's great for the festive season!